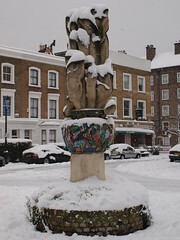 Saturday 14th February 10.00 – 2.00 centred around the Sculpture and the Church, but we can do the wider area too. Come with your ideas for the area – the Council will provide the tools – and skips for rubbish and green waste. Meet by the Sculpture at 10.00 – tell your friends.